Day Canyon: Yes, but a full summer day trip. Start early if exiting out Orderville Canyon. Distance: 8.5 miles from the Englestead Trailhead out the Zion Narrows exit to the parking lot at the Temple of Sinawava. Equipment: 50' webbing, personal anchor system (daisy chain etc.) emergency ascending gear, helmets, dry change of clothing, dry bags and emergency bivouac gear. Sticky rubber hiking shoes and perhaps a hiking staff or poles for the exit out the Orderville and the Zion Narrows. Technical: Longest rappel 270' with an option of breaking that down into two rappels. Wetsuit will be required for the exit through Orderville Canyon and the Zion Narrows in cold weather. This canyon is not recommended when the days are short. Difficulty: River hiking, downclimbing, good rope skills and the ability to rappel the big wall. Permits: Required. Check the weather report before hiking this trail. Do not hike if it looks like rain. Trail Access: Cold river temperatures and heavy current can deter most hikers in the winter months if the chosen exit is the Zion Narrows. Best Season: The canyon is best done in the spring, summer or fall, but watch for thunderstorms overhead during late summer. Englestead is generally a dry canyon with minimal wading, but in the spring, pools may be deep enough to swim. Exiting Orderville Canyon and the Narrows will most likely require swimming. 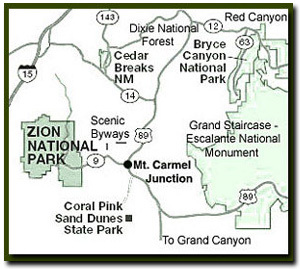 Call the Zion Canyon Visitors Center for weather conditions prior to the hike: (435) 772-3256. Hiking in slot canyons presents a very real danger from flash flooding. Do not hike this trail if it is raining. Remember a storm far off can trigger a flash flood. Englestead Hollow has a high flash flood danger. Never enter a technical canyon without the knowledge and skills needed to safely explore and return. Rappelling and downclimbing skills are required to navigate through Englestead Hollow. Do not jump. Jumping in Zion's canyons have resulting in many broken bones. Trailhead - A high clearance vehicle or 4wd vehicle is a must. From the east gate of Zion National Park drive 2.4 miles and turn at the junction of the North Fork Road and SR-9. Drive 5.2 miles up the road to the Ponderosa Ranch. Turn left at the Ponderosa Ranch under the black arch (sign). Travel .7 miles then turn right at the intersection on the Twin Knolls Road. At 1.45 turn right at the intersection. Follow the well traveled dirt road which will eventually become a high clearance or 4WD road at approximately 2.4 miles. The Observation Point sign is at 2.6 miles. Stay right as the road begins to descend a rocky hill then levels out. At 2.85 miles there is a "Y" intersection. Turn right at the "Y" intersection. At 3.1 miles turn right off the main road onto the road that veers sharply to the right. Drive down the windy wooded road until coming to a dead end turn-a-round at 3.5 miles. This is the parking area at the Englestead Trailhead. This narrow slot canyon has one of the longest rappels found in Zion National Park recreational canyons. Although technically this canyon is just outside the park boundary the exit through Orderville Canyon and the Zion Narrows are inside the park. For a quick trip, exit in East Zion near the entrance for the canyon, rather than the traditional way to the Temple of Sinawava via Orderville Canyon and the Zion Narrows. Englestead Hollow is one of the few slot canyons in the Zion area that has a single 270' rappel or a multi-stage rappel. This canyon is worth the effort to carry a little extra rope. Trailhead - Begin the hike by walking north from the parking area and dropping down the slope to the established "4WD tracks". Follow the tracks for about .25 miles until the terrain levels out. At the level area turn to the left, out of the tracks into the forest, heading north. The terrain becomes steeper as the beaten path continues north. Find the easiest path, but don't veer too far to the east, since there is a ledge system to overcome and by staying a little farther to the west, weaknesses will be found that lead to the Englestead canyon floor. Once in the Englestead wash, turn left and follow the open canyon until it abruptly drops out, into a slickrock gorge. You shouldn't have to walk more than .35 miles once in the wash to arrive at the chasm. First Rappel - The first long rappel, or multi-stage rappel, is done using a sling wrapped at the base of a large pine tree on the left side, looking down canyon. Multi-stage can be accomplished by rappelling 80' down the wall to a 2 bolt anchor, then proceeding from the 2 bolt anchor another 160' to a large bowl in the wash below, then another 40' from the bolt station in the bowl to the canyon floor. This rappel is quite spectacular, but intimidating, so be confident with your skills whether being done as a multi-stage or as a long single rappel. Rappels & Obstacles - The 2nd, 3rd or 4th rappels are done using a sling anchor wrapped around a boulder and will take you 40' deeper into the canyon. The next rappel is from a long webbing - rope anchor attached to a rock and log in the watercourse. This rappel is 20' into a sandy bowl then continues down another 80' through a large "tube fluting" into the sandy wash below. While continuing down canyon notice the walls spread open then close again giving an opportunity to look high above at the depth of the chasm that you'll be descending. Englestead Hollow offers several more short rappels up to 40'. Final Obstacle - At the end of Englestead's slot canyon, just before the confluence with Orderville Canyon, instead of rappelling the watercourse, scramble up the ledge to the left and right facing corner - ramp descending down into to the Orderville Canyon Floor. Englestead Exit - At this point either take the exit up Orderville Canyon to the North Fork Road, or down Orderville Canyon and exiting out the Narrows. Options - Park another 4WD at the Orderville Canyon Trailhead and exit up Orderville Canyon instead of through the Zion Narrows.